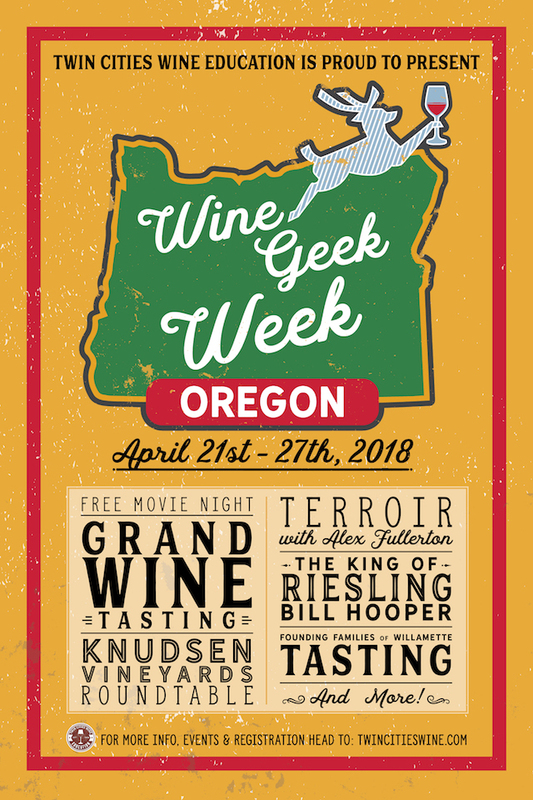 Twin Cities Wine Education is proud to announce the next edition of WINE GEEK WEEK featuring the wines and amazing wineries of OREGON! What is Wine Geek Week? It’s a full week of events, tastings, dinners, movies, and more focused on one geographic area in the world of wine. For the Spring 2018 edition our featured region is OREGON. Included beyond the official Wine Geek Week events are city-wide in-store tastings, 20% off all Oregon wines at select fine wine retailers, and featured by the glass pours throughout the Twin Cities. How do I find events related to Wine Geek Week? On this page you’ll see links for all the official events for the week including classes and the Grand Tasting happening April 25th at the University Club on Summit Avenue (which sold out after the first announcement of the tasting). Additionally, special pricing and features around town can be found through the Twin Cities Wine Education newsletter. Who is coming into town for the Grand Tasting? We’re proud to announce a great room of wine for the Grand Tasting. Special guests include Alex Fullerton, owner/winemaker for Fullerton Winery; Page Knudsen, managing partner of the historic Knudsen Vineyards; Matt Perry, assistant winemaker at Adelsheim Winery; James Cahill, winemaker at Soter Vineyards; and Anne Hubatch of Helioterra and Alter Ego Cider. Additionally, we will have tables representing other great Oregon brands such as Argyle, Domaine Drouhin Oregon, Bjornson, ROCO, and more! Anybody else coming into town for Wine Geek Week? Joining us for a Wednesday night private class on Riesling and more is Minnesota native Bill Hooper of Paetra Winery. I’m late to the party and so much is sold out! What’s the best way to not miss the next Wine Geek Week event? 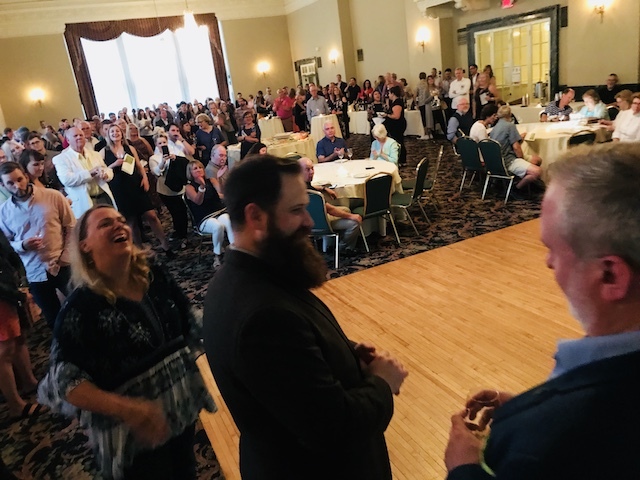 Join the Twin Cities Wine Education newsletter to get the early word on the next Wine Geek Week, coming in September 2018. Saturday April 21st: Free movie afternoon at North Loop Wine and Spirits, followed by a great in-store tasting. Monday April 23rd: Terroir of Willamette Valley with Alex Fullerton of Fullerton Winery, at North Loop Wine and Spirits. Tuesday April 24th: The Grand Oregon Tasting (with free Riedel Pinot Noir XL glass!) at the University Club of St. Paul (sold out). Wednesday April 25th: The Bill Hooper Show (King of Riesling and more) at North Loop Wine and Spirits. Thursday April 26th: Founding Families of Oregon Pinot Noir (with free Riedel Pinot Noir XL glass!) at Cotroneo’s Wine and Spirits. Friday April 27th: City-wide in-store tastings featuring the best of Oregon. Details announced through the Twin Cities Wine Education newsletter. All week long: 20% Oregon wines at select fine wine retailers, plus by the glass features at many of the city’s best restaurants. THANK YOU FOR YOUR INTEREST IN WINE GEEK WEEK: OREGON EDITION!